I must admit that I was a bit surprised when GE dropped their dividend for the first time in 71 years. Just last November they had given some assurances that their 31¢ dividend rate would hold through 2009. But then just 3 months later they cut the dividend from 31¢ down to 10¢. Yikes. If GE can cut their dividend then is any dividend really "safe"? No dividend is truly "safe" and there is no guarantee or obligation for the company to continue to pay a dividend. A company may cut their dividend at any time based on their financial situation. Or in the worst case if a company goes bankrupt then they will no longer exist to pay a dividend. If you are investing in stocks based in part on dividend yields or if you are counting on dividend yields for retirement then you should be aware and plan for the possibility that companies may cut their dividends. Some dividends are safer than others. The dividend of a financially sound company with consistent profits and lots of cash in the bank is going to be safer than the dividend of a company with significant losses and substantial debts. This Businessweek article lists what they consider to be the US Companies with the Safest Dividends. Certain kinds of companies are more likely to continue paying dividends. For example a REIT (Real Estate Investment Trust) is required to pay 90% of its profit out in dividends. That is part of the structure of a REIT. Other unique companies like the BP Prudhoe Bay Royalty Trust (BPT) are setup specifically to pay out a dividend yield as part of their operations. These types of stocks have more obligation to pay dividend. But even they are not "safe" to count on. The dividend of a REIT will fluctuate and is only as safe as their ability to make profits. Many REITS have cut their dividends lately. The BP Prudhoe Bay Royalty Trust dividend rate is dependent on the price of oil. Due to the drop in the price of oil the latest dividend from BPT for April is less than 1/3 of what it was back in July 2008. Bottom line : if you are investing in stocks with dividends then keep in mind that dividend payment rates are not guaranteed and are never really totally "safe". The media has been reporting lately that 12% of homes with mortgages are behind on payments or in foreclosure. If you skim the article you'll quickly find this : "A record 12 percent of homeowners with a mortgage were behind on their payments in the first quarter, the Mortgage Bankers Association said Thursday." Wow. If its a "record" then that means its the worst ever right? Does this mean that we're worse off now than in the Great Depression? No. The current delinquency rates are not nearly as bad as the Great Depression. is the rate of mortgages with past due payments. average time of delinquency was 18 months. So while they say that there isn't comprehensive data from the 1930's the data they do have shows that default rates on mortgages were north of 40-50% level. This is just one reference though and it is hard to find much information on mortgage default rates during the Depression. I came up with this WSJ article that said: " the mortgage default rate of over 40% in the depths of the Great Depression." The current "record" 12% rate is nowhere near as bad as the 50%+ default rates seen during the Depression. Why then does the press call the 12% rate a "record" if its not really the highest? Well we can figure that out by reading that they didn't have comprehensive data from the 1930's. When did they actually start tracking it? The references in the press to the 12% default/foreclosure rate is from the Mortgage Bankers Association. Those are the folks that did the study. If you hit Goggle with their name you can easily find the initial study from them that the press are reporting to us. Here is the original Mortgage Bankers Association press release. They published the initial findings that 12% of homes are in foreclosure or delinquent: "The combined percentage of loans in foreclosure and at least one payment past due, meaning the percentage of mortgage holders not current on their mortgages, was 12.07 percent on a non-seasonally adjusted basis, the highest ever recorded in the MBA delinquency survey. " But before that bit they have a very important sentence in their press release that the media seems to have overlooked or not considered worth reporting to us all: "The seasonally adjusted rate is the highest in the MBA’s records going back to 1972 and the unadjusted rate is the highest recorded in the first quarter of any year back to 1972." Bottom line: 12% is not really a record. Its a the highest they've seen since they started measuring it in 1972. Thats not a record at all. The media shouldn't be calling it a record if its just the highest since 1972. Money Smart Life features :5 Money Rules from Liz Weston I especially like the 50% needs, 30% wants & 20% savings budget system. She also says not to borrow more than your expected first year of income in student loans which I've written about in the past. How Many People Benefit from Mortgage Interest Deductions? 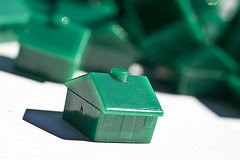 One of the widely known benefits of home ownership is that you can deduct the mortgage interest from your taxes. But not all of us are in a position to take advantage of that tax break. Exactly how many people actually see a tax break on home mortgage interest? The IRS has a lot of tax statistics including tax statistics for individuals. One is the breakdown of stats for people with itemized deductions in 2005. There we can see that about 38.5 million people itemized their deductions and claimed home mortgage interest. The Census has all sorts of information. The current 2009 Statistical Abstract shows a wide variety of stats on Americans. They have a whole section on housing. One of them is the Mortgage Characteristics of Owner Occupied Units for 2005. There we can see that about 48.3 million home owners had regular mortgages and/or home equity loans. I'm using 2005 figures since that is the latest year I can get both figures for. So comparing those two numbers of the 48.3 million people who could have theoretically gotten a tax break on their mortgage only 38.5 million did so. That is about 80% of us who benefit from home mortgage interest tax deductions. Put that another way 20% of the people with mortgages on their homes got NO tax break from it. Also among the 80% of home owners with mortgages that did itemize, a portion of them would not have gotten the full potential tax benefits. Itemization with a mortgage interest deduction may have been marginally worth it compared to the standard deduction. For example if you are single and in the 25% bracket. You paid $5000 in interest and $2000 in taxes but you live in Nevada with no state taxes so thats all your deductions. Your itemized deductions are worth $7000 including $5000 in mortgage interest but the standard deduction is $5700. So your benefit from itemizing with the home deductions is $1300 rather than the full $7000. While the mortgage interest tax deduction is a good benefit of buying a home it is not something that everyone will get the full benefit and a considerable number of people (20%) get no tax benefit from it whatsoever. The National Council of State Housing Agencies website has links to state agencies that can help home buyers. This page at NCSHA has a drop down to find the agency for your state. Simply select your state and it will give you a pointer to your states agency. It seems that every state has some sort of program to help first time buyers afford a home. The details of each states program differs but it seems that in general you have to be below an income threshold and the cost of the house has to be below a maximum. Generally it looks like the income limits are around median income levels so most people should be able to qualify as first time buyers. For example I select Alabama (first on the list) and it points to the Alabama Housing Finance Authority website. I poke around there and find they have a Mortgage Credit Certificate program that gives you a tax credit for 20% of the interest of your mortgage. So with a $100k loan at 6% you'd get $1200 in tax credit annually. Thats $100 to help you towards the purchase of your home. Some states have below market interest loans, help with closing costs or other benefits to help new home buyers. To see if your state has a program that could help you buy your first home check out the page at NCSHA. Previously I explained that I was going to start a project to cut our home energy costs. The initial plan was posted here. 3. Prioritize the energy saving options. Last week we got stop #1 of the plan done. Our local utility offers a free home energy audit. We took advantage of this audit. The audit was basically just a walk through inspection. I wasn't sure entirely what the audit would consist of before we signed up. I had hoped that they would do some air leak testing with a door blower or things like that but they did not. Thats OK though since the audit we got was free. They recommended that we get our ducts and the home tested for leaks first. If the ducts needed work then it would be best to get those tested and done first since they are covered by insulation in our attic. You wouldn't want to add insulation then have to test the ducts and fix the ducts after that since it would disturb the new insulation. Most of the options would give us good energy improvements. The new energy efficient water heater and the solar power were not so clear so they suggested we investigate those further. Our water heater is in pretty good shape and doesn't need to be replaced anytime soon. Solar may or may not be worth the investment for our home and it would take a solar expert to take a better look at our home and figure the cost and benefits. The auditor also explained the different incentives we can get from the IRS, state and the utility. For the insulation we can get $0.25 per square foot from the utility for the attic and $0.40 per square foot in the crawlspace. The utility will also pay 50% of air sealing up to $400. The IRS will give a tax credit of 30% up to $1500 for any of the insulation or heatpump. We could also get up to $750 for a heat pump between my state and the utility. If we did all the insulation, air sealing and added a heatpump we'd be eligible for about $3,500 in tax credits and rebates. I'm guessing that would cover about 25-50% of the costs. After the audit results this gives us an additional step in our plan. The next step : Step 1.5 will be to follow up with air seal and duct leak testing. We'll take care of that next. We'll have to call a few people and get someone to come out. It will probably take a couple weeks to get this step done. In addition to performing the audit they also gave us some Compact Fluorescent Lamps, free low flow shower heads and aerators for our sinks all entirely free. I figure we got at least $25 worth of free stuff. That free stuff was a nice bonus. My Updown account is currently down 16.4% in total. Annualized the past year has been at -14.6%. This is better than my last report when I was down -20%. The S&P 500 is down -33% in the same period so since March 2008, I'm beating the S&P 500 by 17%. I haven't made any major changes in my portfolio lately. The market has been rebounding somewhat this year. So thats part of why I've done a bit better than previously. Another reason I'm doing a little better is that the stocks I've bought have been paying dividends. I've got about 1.5% yield so far in 2009 from dividends. This weekend I made a hotel reservation for later this summer. My wife and I are taking a short trip to a neighboring state for a mini-vacation. I ended up using Hotel.com to book the hotel. I shopped around different sites and Hotel.com was the same price as the direct booking with the hotel company but with Hotel.com I got 3% rebate back from eBates.com. I also noticed that eBates has a 2% rebate for Hotwire.com. If you're not familiar with eBates you can see my first article on eBates here. In brief, you sign up with eBates and then follow their links from their site go to the online merchant of your choice to buy the items you want. After you make the purchase at the online merchant you'll get a rebate from eBates. So next time you book travel check eBates to see if you can get a discount. I'd recommend comparison shopping at all sites you can to find the cheapest one. Then once you figure out which site will get you the best rate check if they have an eBates rebate offer. Have you ever been driving along and had your eye catch a big sign for a sale with something like "50% off" in big giant letters? You think about stopping and checking it out. But then you read the full sign and notice the full text says "up to 50%". Cynically this automatically makes me conclude that its not really 50% off at all but its probably 10-20% off maybe on most things and then 1-2 token items at 50% off that nobody wants. "Americans make large salaries up to $50,000,000 per year." ... Ok yeah there are a few people making that much, but it says nothing about Americans as a whole. "When playing blackjack my winnings were up to $5,000." ... But then I lost it all and tipped the dealer my last $10. One company that uses the "up to" words in their literature is Discover Card. You can get a rebate of "up to 1%" back for most purchases with your Discover card. It takes a big of digging around on the Discover card site to find the exact meaning of "up to". Personally I like Discover card as a company and have been happy with their service. But even with a good company you have to keep your eyes on the details. So its not 1% but something below 1%. If you charge less than $3000 a year on the Discover card then you will only end up making 0.25% on it. If you charge $500 a month average on your card then you'll total $6000 in charges a year. You'd make 0.25% on the first $3000 and then 1% on the next $3000. That comes out to $37.50 or 0.625%. If you charge $2000 a month then you will get closer to the 1% level. That would get you up to a net rebate of 0.9% on your $24,000 of purchases. Paying attention to the words "up to" can make a significant difference. Back on Sept 21st I posted about my asset allocation. The increase in equities is due to adding more to our Roth IRA plans. So that area went up in spite of the stock market going down. 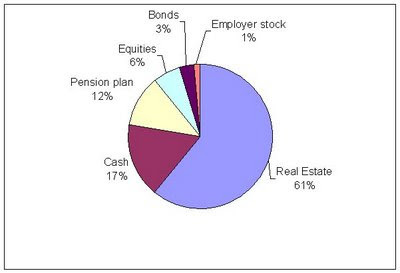 The drop in employer stock and pension plan are both due to losses in the stock market. Cash went up because we've accumulated more cash. Bottom line is that our asset allocation hasn't changed much in the past 8 months. Wise Bread: How will the new credit card rules affect consumers? The Simple Dollar: The Credit Cardholders’ Bill of Rights Act of 2009 Is Here: What Does It Mean For You - And What Might It Mean for the Future? The act will make a number of changes in the laws about how credit card companies are allowed to conduct business. Some of the changes are sorely needed. Most of the changes are going to favor consumers in general. I don't think any of the changes will directly impact my use of credit cards. But its possible there could be indirect impact if the card companies feel a need to compensate for lost profits by changing the terms of my card. My rewards rates could go down or they might add annual fees. I'm not too afraid of either of those. If the card companies get too stingy with the rewards or want to charge me a fee then at some point I'll simply stop using them. I bet they are smart enough to realize that. They get paid no matter what as long as I keep using their cards. The transaction fees from merchants easily pay for my rewards rebate. I doubt the credit cards would risk throwing away my business. It is feasible that some day we might mine all the gold and gold will be harder to find and mining production will go down. One day the mining production of gold in the world may hit a peak. How do we know if or when gold has peaked? 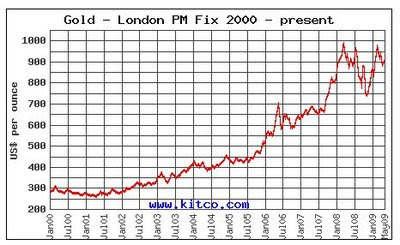 Some people believe that we hit a gold production peak in 2001. In this article on Kitco the author a Dr Thomas Chaize says that they believe we hit world peak production of gold in 2001. The original article is on the author's site. He has a graphic showing the peak in 2001. Here is another article where the author feels that we may have already hit the peak in production. The production values are in metric tons. If you look at this chart alone it does definitely appear that production peaked in 2001. The maximum worldwide production was 2,600 in 2001 and we haven't hit that amount since. In 2007 the total production had fallen to 2,380. How do we know gold production has peaked? Does six straight years of falling production mean that we'll never see an increase again? If you compare the two graphics the peak in production around 1915 seems a bit more distinct. In the next 7 years from 1915 to 1922 production went from 704 to 481 or a drop of 31%. The drop in production from 2001 to 2007 is only down about 8% from the peak of 2001. 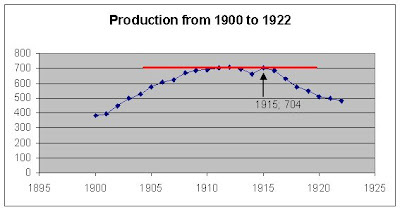 If it was 1922 and you looked at the chart above then would you think that production may have peaked in 1915? It looks more like a peak than the 2001 peak. Lets look at all the data from the USGS site on world gold production over the past 100+ years. 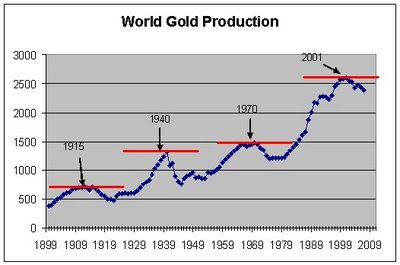 Here is a graph showing the world gold production from 1900 to 2007. There have been 4 distinct peaks in production over the past 100 years. We hit peaks in 1915, 1940, 1970 and 2001. I would assume that the peaks in 1915 and 1940 were caused by disruptions due to WWI and WWII. Long term it appears that the gold production has cycles with short term ups and downs. In short term periods these ups and downs form peaks. If you were sitting in 1922, 1950, 1978 or 2007 and looking back over the previous 20 years of production then it might appear that we've hit "the" peak. But if you then look forward after those points we see production goes up again. How much gold is left? There is a limited amount of gold buried in the ground for us to find. Eventually gold will become harder and harder to find and we'll likely mine as much as we can and production will drop. But over the past 100 years the gold production has increased steadily. If you add up all the world gold production from 1900 to 2007 the total amount mined was over 130,000 metric tons. Right now the gold reserves left in the ground are estimated at 90,000 metric tones. That figure was from the USGS report in 2007. The amount of gold left in the ground is a moving target. As technology gets better and more gold is found our estimate of how much gold is left goes up. Back in the USGS 2001 report the reserve gold estimate was 77,000 tons. Then from 2001 to 2007 the world mined out over 17,000 metric tons. If we started with 77,000 ton reserve and mined out 17,000 tons then you'd expect that by 2007 the reserve would be down to 60,000. But it wasn't, in fact the reserve had a net increase of 30,000 gold in 6 years. This means that we were finding new gold reserves almost twice as fast as we were mining it. 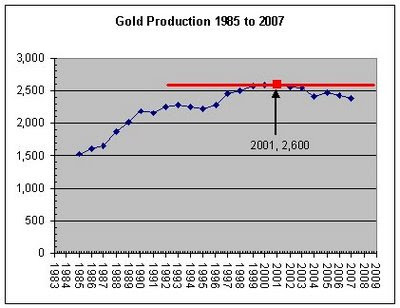 Nobody can say for fact if we've hit the peak in gold production. The cycle of ups and downs in gold production over the decades and the fact that we've been finding gold faster than its being mined are two solid reasons against the conclusion that we've hit gold peak. This is nothing more than my personal opinion or "My 2¢"
Some people call the lottery a "stupid tax". The idea being that people are being taxed for their stupidity by playing the lottery because the odds of winning are so low. 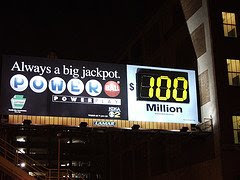 It is true that the odds of winning a mega lottery jackpot can be astronomical so its not "worth it" to spend $1 on a ticket. Would you spend $1 on a one in 100 chance of winning $20? Probably not. But many people will spend $1 on a one in 100 million chance of winning $20 million. Thats not really the point of playing the lottery. The lottery is for entertainment purposes. Just like any other form of gambling the reason people spend $1 on a lottery ticket is that they enjoy doing so. While playing the lottery in small amounts can be fun for entertainment purposes you need to make sure you don't go too far. You should spend half your paycheck on lottery tickets any more than you should spend half your paycheck on any other form of entertainment. You shouldn't expect to win either. The odds against a jackpot are very very very poor and odds of winning anything are not very good. My 2¢ : Its OK to play the lottery in small amounts just for fun. FMF highlights a pretty good Top 10 Investing Rules of Thumb from the ETF Database site. Long Term Care (LTC) refers to medical care services over a prolonged period of time. Its often in a nursing home. LTC can be pretty expensive. The average cost of a year in a nursing home in 2008 was $68,000. Long Term Care insurance is a form of insurance that you can buy to pay for the possible costs of LTC. Lets consider the question: Is LTC insurance something you should buy? Is LTC something you'll need? 70% of Americans will require some LTC in their lifetime. 40% will need care in a nursing home for some period. Women 3.7 years and men 2.0 years. 33% never need care, 20% need over 5 years. Most LTC needs are for people over age 65. However this study says that 37% of people needing LTC in 2000 were under age 65. The risks of needing LTC grow with age. Only 1.4% of people under 65 currently need LTC, 14% of people over 65 need LTC and HALF of people over 85 need LTC. Conclusion : It is probable that you'll need LTC and most likely it will be 2-4 years of care after age 65. So now that we know LTC is something we're likely to need, next we should look at the likely cost of insurance. LTC premiums can be pricey. The premium costs will go up with age. The younger you are the lower the costs will be to get a premium. The following table of average costs are from the government Longtermcare.gov site. I got a quote from this site Long Term Care Quote. Unfortunately they want contact info. The quote result was from 3 reputable insurance companies. They offered coverage of $100 a day for up to 3 years. The premiums varied in the $91-$104 / month range for myself at age 37. So that is around $1,200 a year premium. Should you buy Insurance? If so then at what age? LTC insurance is pretty pricey. There aren't a lot of people with $2,000 to $3,000 a year to spare. If you can't really afford LTC then its not something to go out of your way to buy. However if you do have the funds to afford it then it might be worth something to consider. Looking at the costs of insurance at different ages, I think that you're not likely to have it pay off if you buy LTC insurance in your 30's or 40's. Few people need insurance at that age and if you keep paying on a policy till you hit your 60's or 70's then you may as well just self insure. But if you look at the costs for LTC insurance in your 60's then you could be paying $2000 to $2500 annually for a policy and make use of it within 10-20 years. Given the average cost of LTC this should be worth a purchase. With that thinking in mind, I wouldn't buy LTC until you're around 60-65 age. LTC insurance is an optional insurance and would fall below higher priority insurance such as health insurance, auto insurance, home insurance, disability insurance and life insurance. Bottom line: LTC is optional purchase if you have the means and I'd wait till age 60-65 to consider it. A Consumer Reports article on LTC isn't very positive about the insurance. They say: "A CR investigation, for which we reviewed 47 policies, reveals that for most people, long-term-care insurance is too risky and too expensive. " A couple recommendations Consumer Reports gave are agreeing with my suggestion to consider buying a policy around age 65 and they also recommend to look for a strong insurer. The Bureau of Labor Statistics website is full of great economic data. I've previously discussed the consumer expenditure survey. One of the items expenditure categories they track is health care related spending. They track total health care spending and break it down into sub categories of health insurance, medical services, drugs and medical supplies. We've all heard how medical costs are going up and up and up and I'm sure most of us have seen our own medical insurance costs increase. So I decided to check out the data on the BLS site to see how average consumer spending on health care looked. That looks bad doesn't it. Costs just keep going up and up and up. But lets look a little closer. 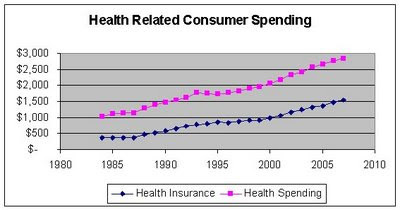 If you figure the average compound annual increase from 1984 to 2007 the spending on health insurance has gone up 6.4% and total health care spending is up 4.4%. If you look at just 1997 to 2007 the increases are 5.8% on insurance and 4.5% total. For the latest 5 years of data the increase was 5.8% for insurance and 4.0% for total. A 4-6% annual increase is a bit more than inflation as a whole. But an interesting thing happens when you compare health insurance and health care cost spending to our income. From 1984 to 2007 total the after tax income went up from $21,237 to $60,858. Thats an annual growth rate of 4.7%. Before tax income went from $23,464 to $63,091 for a 4.4% annual increase. Increases in income outpaced increases in health care spending from 1984 to 2007. So while health costs have gone up and up and up our income has actually outpaced the increase in health costs. In fact in 1984 our total health care spending was $1,049 on average and our income after tax was $21,237. That means we spent 4.94% of our after tax income on health care. In 2007 the spending increased to $2,853 and income increased to $60,858. That represented 4.69% of our income. While health care costs appear to have gone through the roof, the % of our income we spend on health care actually went DOWN a fraction of a percent. I should make a couple points about this. First of all I'm looking at average figures. This doesn't really show much of a picture. It also doesn't capture the impact from more and more Americans who are going without health insurance altogether. They are spending less because they are choosing not to spend anything on insurance at all. While we are spending about the same total on health care fewer people are actually covered by insurance. So there is a net loss. Previously I'd reported that KFC had canceled their free grilled chicken coupons. That is what I had read in the news article at the time. The article used the word 'canceled'. However KFC is actually giving out rainchecks for the coupons so you can use them at a later date. Plus they're adding free Pepsi to the deal. Read about the raincheck at KFC's site. You have to get a form at a KFC to fill out and return it with your original coupon by May 19th. Personally I still think that changing the original terms of the deal is lame on the part of KFC. But at least they are giving people an opportunity to get the free meal plus throwing in a free drink as well. Save 70% Off with every order of $25 Gift Certificates with code TASTY. Pay $3 thru 5/16/09. I thought it would be interesting to look at the rate of increase in unemployment during this recession and compare it to previous recessions. The BLS has monthly historic unemployment data. This CNBC article has a list of the recessions from the 20th century. So I pulled the monthly unemployment rate and then looked at the unemployment levels during the previous recessions. 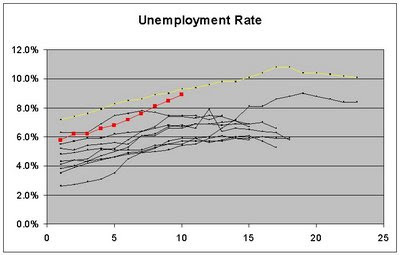 Then I charted the unemployment from the start of each recession until 6 months afterwards. The unemployment rate for each recession + 6 months is shown below. The red line is the current recession. The yellow line is the July 1981- Nov. 1982 recession. Again the current recession is in red. 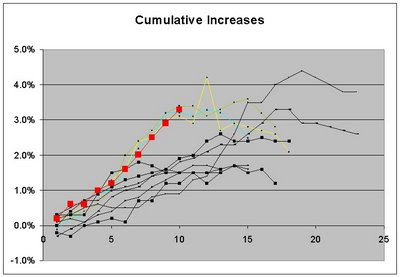 I highlighted three other recessions that had similar increases in unemployment. The Nov. 1948 - Oct. 1949 in yellow, July 1953 - May 1954 in green and August 1957 - April 1958 in light blue. Since this recession started the unemployment rate has gone up 3.3%. For each of those other 3 recessions the unemployment rate went up 3.1-3.4% in the first 10 months. The rate of increase in unemployment during the current recession is very similar to the rate of unemployment during the recessions in the late 40's and 50's. The unemployment rate usually peaks at the end of the recession or within 3 months after the recession ends. In historical trends, if unemployment flattens off or starts to drop then thats a good indicator that the recession is ending. We haven't seen unemployment start to go down yet. A while ago one of my friends was working very long hours. He had pretty good pay and was making something around $90,000 but he was required to work about 60 hours a week and he was on call a lot. We'd go out to dinner and his pager would bleep away and he'd be typing out responses. When he was on call he'd probably a few pages an evening. Some days he'd be on call 24 hours so he might be required to get out of bed at 2AM to go plug in his computer and dial in to do some remote work from home. Don't get me wrong $90,000 is a lot of money so its hard to complain too much. But by comparison to my friend: I work for the same company, I have less education, I have less responsibility and stress, I work 40 hours a week give or take and I am never on call yet I make just as much money as he does. Clearly my friend's job wasn't compensating him well for all the work he did. Its important to compare the hours worked and the salary to see the the hourly rate for a job and not just look at the total salary. Lets just estimate that he and I both make $90,000. Its not exact but close enough for discussion. He worked 60 hours and I worked 40 hours. On an hourly basis he made about $30/hour and I made about $45/hr. Our gross income was the same but on an hourly basis I was making 50% more than he was. Thankfully my friend has since moved to a better position at work and now he works a lot closer to a regular 40 hour /week job. Lets look at another example. Say two recent college graduates are pursuing different careers. One has just finished a math degree and is going to start as a teacher. They are making $35,000 a year. The other person has an engineering degree and their starting pay is $55,000. The teacher works 8 hour shifts for 189 days a year or 1,512 hours a year. The engineer works 8 hour shifts 240 days for 1,920 hours / year. On an hourly basis the teacher is making $23.15 /hr and the engineer is pulling in $28.65/hr. Clearly the engineer is doing better. But lets look at the situation if the engineer works 50 hour weeks rather than 40 hour weeks. That would result in a total of 2,400 hours a year and their $55,000 salary would give them an hourly rate of $22.92 /hr. In this situation the engineer is making less per hour than the teacher. Of course its also possible that the teacher could be working 10 hour days and the engineer might work 8 hour days. There is also an advantage to having a higher gross salary as it will provide a higher standard of living. But does a higher overall pay come at the expense of high stress and burning yourself out spending most of your days at work? Next time you're looking at a job make sure to figure out how the hourly pay would look. This would probably be worth it for me to check out if at any time I'm in the job market again. I don't think I did a particularly good job negotiating for my wages when I started work at my present job. The Money Tips Network was launched. Its a network of several very good personal finance bloggers including all my favorites. So if you're looking for a good single source for personal finance blog articles this would be a good one. Free Money Finance is having a drawing to give away A Box of Books To be eligible for the contest you have to sign up for his newsletter. Postal rates are going up to 44¢ for regular first class letters. Thats a 2¢ increase. If you know you'll need some stamps next year then right now is a good time to go buy some Forever stamps. You could get a sheet of the Forever stamps today for 42¢ and then next week they'll be worth 44¢. You can buy Forever stamps online at the USPS site or at various local retailers. I wouldn't go out of my way to buy a big pile of stamps. But if you know you'll be using a few within the next year then it could save you a few bucks to lock in the 42¢ cost before the rate goes up on Monday. You can use Energy Star's Home Energy Yardstick to assess your home energy use compared to similar homes. You enter your ZIP code, the # of people in the home, the square footage and the amount of your energy bills. It will then show how your home fits on the 'yardstick' comparing your energy use to similar homes on a scale of 0 to 10 with 10 being the best and 5 average. Since it uses the ZIP code and other specifics such as # of people and size of the home its a pretty good apples to apples look at how you're doing. Our house is less than 30 years old and fairly well insulated. Its hard for me to believe our energy efficiency is that low. I did some trial and error and it looks like according to the yardstick data that we're spending about double the average for similar home in our area. One detail that makes our score look lower is that we have a electric plan that uses only wind power. We pay a little more for that wind power plan but the prices are fixed for 5 years. We also have basically zero CO2 emissions since our power is 100% from clean wind power. My wife works from home with her home based business so she is at home most of the day. That make our heat bills higher than average compared to a lot of people who are not at home during the day. I wonder if they are comparing my home to all homes including those using natural gas or other forms of heat? Our house has an electric forced air furnace and an electric water heater. We'd have much lower energy costs if we had a gas furnace and water heater. So if they're comparing us to everyone then we might look pretty bad compared to the folks using gas. Of course its possible that our house is really inefficient and it just needs some improvements to make it on par with our neighbors. What to do to improve it? Still even taking the above points into consideration I think we could still be higher than average for the home our size in our area. If you continue on the yardstick site after you get the results you can follow the "improve your results today" section and fill in the details on your Air conditioning, furnace and water heater and hit the "submit button". This will then give you a popup with some suggestions on how to lower your energy use. #1,2,3 are all sound like very good potential to improve our homes energy efficiency. We've already got CFL's and a programmable thermostat so that mostly takes care of #6 & #7. We're not due replace our windows and those can be pretty expensive so I don't think #5 is worth much consideration. #4 and #8 would take more investigation. But most of our appliance are relatively new and I don't think theres all that much savings to be had by buying new ones. I think I'll wait till its time to replace them then get Energy Star. I mentioned previously that we have a plan to cut our home energy costs. The first step of that plan is to get a home energy audit provided by free from our local utility. Once we have the audit that should give us some specific detail on our home from an expert. We'll then look towards taking action on their recommendations. I bet that the #1,2 and 3 items in the suggested list from Energy Star will also be recommended after the audit. The Energy Star Yardstick site will give you a ballpark estimation of how your homes energy efficiency stacks up. I doubt its perfect, but it is a good starting point. If your score is below average then you probably have some improvements to consider. As a further step I'd recommend a real home energy audit conducted by an expert like we're getting. KFC has a coupon via the Oprah.com site for a FREE grilled chicken meal. The coupon is good until May 19th (except Mothers Day). Its good for 2 pieces of chicken, 2 sides and a biscuit. The other day I updated my net worth and I mentioned in there that our cash assets were up significantly primarily due to a big fat tax refund. We're getting over $9,000 back this year. I got married this year so our tax circumstances were abnormal. A big reason our tax refund was so high was that I didn't adjust my W-4 withholding to reflect the change in marital status. So they withheld taxes as if I was single the whole year. Another major reason we had a large refund is that we donated a lot of household goods to charity. When my wife moved in with me we had a lot of unnecessary, duplicate 'stuff' to get rid of. And we also took the opportunity to clear out our closets. That gave us a pretty large charitable deduction. Also we had two homes for part of the year and paid mortgage and property tax on both so we had extra deductions from that. None of this was planned. Its also not stuff that will occur in future years. The only 'mistake' I made was not changing my W-4 sooner but that would have only reduced the refund a bit. A couple other factors that lead to the lower tax bill were sale of stock that resulted in a loss and our rental property depreciation. The depreciation on our rental property gives us a good tax shelter. This year we had over $8000 in depreciation to deduct. Stock sales and rental depreciation are things we'll have again in the future. Usually stock sales will show a gain, but I might have losses in the future too. I could manage that a bit more to try and maximize the tax consequences. But I don't think theres much opportunity to juggle that to an advantage. Overall stock and rental income elements will be variables in our annual taxes. Mostly they should be gains but some years they will be down. In future years our tax situation should stabilize and be more predictable overall. I don't expect to get large refunds like this again. I track my net worth monthly on NetworthIQ. For April 2009 my Net Worth is $580,699 which is up $17,522 from the previous month. On the positive side: cash assets increased over $7,700 and stock and retirement were each up about $4,000. Cash went up mainly due to a large tax refund and the stock and retirement are up mainly due to gains in the stock market We paid down our mortgages by $1,800. On the negative side our real estate assets continued to drop in value a little as a whole. Our house was down about $1000 and other real estate was up $750. I should note that I'm using Zillow as my means to estimate real estate values and theres certainly a margin of error in that estimate. The range of values that zillow gives for our other real estate holdings (rentals) is from around $216,000 to $354,000. Thats -35% to +5% difference in those assets. That difference means our net worth could be off by as much as $120,000 in the worst case. However given what I know about the local real estate market I the estimate used is pretty accurate so its more likely to be within +/-5 or 10%. We spent about $2,100 on electricity and heat for our home this past 12 months. Electricity including heat is one of our biggest expenses. As far as bills it comes in #3 behind our mortgage and food. Since we're spending $2,100 a year on electricity this is a good area to try and cut some costs. Our home has a forced air electric furnace. Our electricity rate comes out to about 10¢ per kWh. An electric furnace is not particularly cost effective. Our home is not new but not particularly old and it was built in the 1980's. The insulation is fairly good but not great. Our windows are double pane and don't seem particularly drafty. I believe there are a few good areas for improvement in energy savings in our home. We've already done a few things to keep our energy use lower. We installed a programmable thermostat. Almost all the lights in our house are Compact Fluorescent Lamps. But I'm convinced that there are other cost effective measures we can make to save on our energy costs. Things we haven't done that would likely be good improvements: Add a blanket to our hot water heater, install a water heater timer, weatherstrip and seal our home, add insulation to our attic, add insulation to our crawlspace, upgrade to a heat pump, install a solar water heating system and install solar electric panels. These improvements range in cost of under $50 for a water heater blanket to several thousand $ for a heat pump installation. Which improvements we choose to do will depend on the cost effectiveness and savings for each. Our local utility offers a free home energy audit. They come to your home and check everything out, do some tests, and then they give you a report telling you what areas you ought to improve to reduce your energy spending. We've signed up for such an audit later this month. You might want to check your local utility and see if they offer such an energy audit, many utilities will give free audits. The audit should tell us what are the things we should improve. I expect they'll tell us to do some weather stripping or other air sealing. They might very well tell us to add some insulation in our attic and/or crawl space. Given the results from the audit and other options we know of we'll prioritize the options to get the best return on investment. I'll most likely use simple payback period to prioritize them. The final step of the plan will be to get the improvements done that will save us the most money. I'll write more articles in the future to discuss these steps as we pursue them. It could take us a few months to get to the implementation phase. After we've done the improvements I'll also want to continue to monitor our energy costs to verify the savings pan out.